Keep your carrot sticks and jugs of juiced kale, I say; give me potato chips. And—the key consideration here—they actually go well with wine. Keep your carrot sticks and jugs of juiced kale, I say; give me potato chips. As far as I’m concerned, they’re the ultimate snack food. And, in general, America seems to agree, since we eat about 17 pounds per person per year of them (according to the USDA). And—the key consideration here—they actually go well with wine. 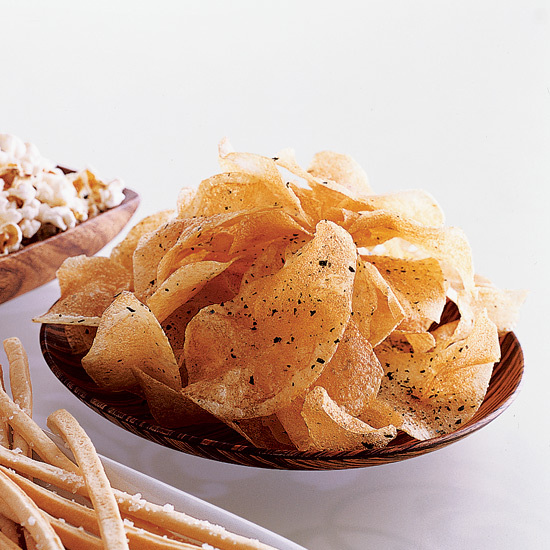 So in a kind of nod to public service, here are some suggestions for potato chip pairing. Champagne. Salt and fat both love Champagne (and vice versa)—the wine’s high acidity and the prickle of those bubbles are the ideal preparation for the next chip, and the next, and the next, and so on. If you don’t feel like splurging for the real stuff, most American sparkling wines are made in the same manner with the same grape varieties. One of the best is the NV Roederer Estate Brut ($20), from California’s Anderson Valley. Barbecue chips get their flavor from a weird range of ingredients—honey powder, onion powder, garlic powder, hickory smoke powder, barley malt powder, tomato powder, the list goes on. But one thing that’s common to a lot of them is yeast extract, which essentially imparts a savory, umami note—the sort of thing that’s ideal with an earthy, spicy Pinot Noir. The 2010 Chalone Monterey County Pinot Noir ($15) is a fine option, full of appealing strawberry and raspberry notes. Whatever it is that chip companies use to coat chips with sour cream–ish dust, you’re still going to want a fairly luscious white for this species of chip. California Chardonnay—why not? The 2010 Hess Select Monterey County Chardonnay ($11) does a good job of balancing its rich tropical fruit notes against a reasonable amount of acidity. Tanginess loves tanginess when it comes to wine pairing (for instance, a vinaigrette on a salad will go best with a tart white lke Sauvignon Blanc). True for the chip as well, though with this particular flavor I think beer wins out over pretty much anything. But if you’re dead set on wine, go for a light, crisp, unoaked white such as Pinot Grigio. Alois Lageder’s 2011 Riff Pinot Grigio ($11) has more character than most affordable versions, with crisp apple fruit and a hint of spice. An invention of the British, I’m told, and a mighty fine sounding one at that. Obviously, the answer is exactly what you’d drink with lamb—a fine claret (which would be the classic British term for Bordeaux). It’s a potato chip, though, so don’t go crazy; there’s a lot of affordable Bordeaux out there that’s very good, like the aromatic, beautifully structured 2010 Moulin d’Issan ($17).